Tired of struggling to grow your Instagram? Turn your Instagram into a Shop-able store with our FREE e-book! Instagram is constantly changing. Our clients are winning by running their Instagram on targeted, active organic traffic! Quality organic traffic drives more opportunities for your business and brand from the first touchpoint to the point of sale. So, what is organic traffic? Organic is the foundation for social media and how Instagram works today. You post, like, and comment on Instagram and your profile increases its exposure. These actions are at the core of the Instagram algorithm. It's pretty simple. The more activity you generate, the more the Instagram algorithm works in your favor. For the bigger Instagram accounts, this is where they become really powerful. Any activity you can do on the Instagram app is organic activity. This includes the action to like, comment, share, direct message, follow, and unfollow. we get active on instagram for you. We execute a proven strategy to target the right people and niches for your business or brand, and we organically reach out to them to introduce them to your brand. We call this the ‘social media handshake’ and we have years of experience expertly managing this strategy to provide our clients with steady, quality traffic to grow their businesses and brands on Instagram. 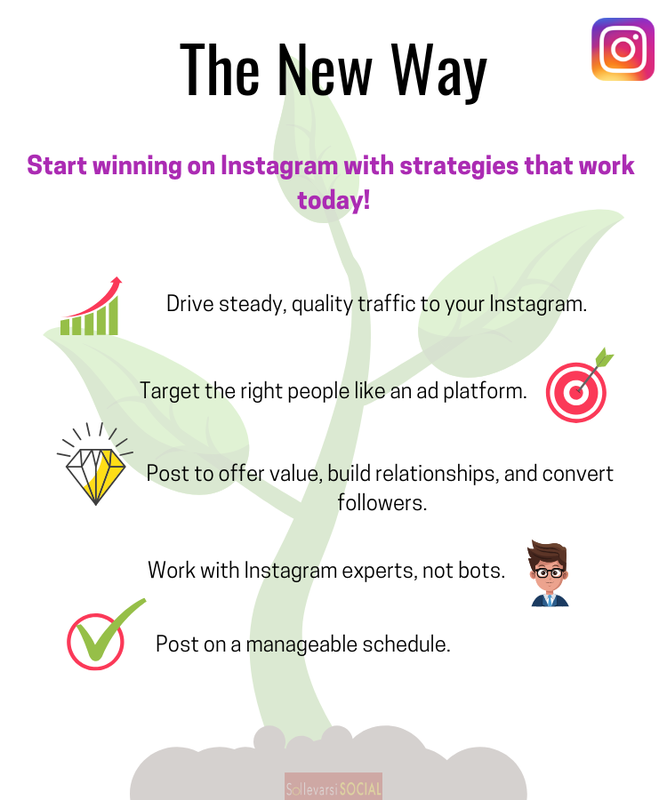 This strategy democratizes Instagram and allows you to drive traffic like a much larger account. It also allows larger accounts to add steady, targeted traffic to increase their impact. Build trust. Build a brand. Grow your business. Bad traffic doesn't grow your business or brand. That's why targeting is so important for our clients. We work hard to target not only the right niche for your brand, but the right people in that niche who are ready to convert into profile visits then into followers. Our experts do extensive market research to find the right people and where they go on Instagram. This starts your traffic funnel off with quality traffic that converts. These are the people that will grow your business. Now, you can post content to provide real value, build trust and relationships, and turn these new followers into loyal customers. We hate fake followers and bad follows. Nothing in advertising is perfect, but we work really hard to avoid them. We hate bad traffic more than you do. The proof is in how well our traffic funnel converts. Mike Burgio is a craftsman with an amazing style and vision in a very specific niche. His e-commerce business offering handcrafted architectural door pulls and hangers on Shopify is booming along with his Instagram. Hrdwre_Design came to us with a visually beautiful Instagram connected to a quality Shopify store. But, his Instagram was growing slowly and it wasn't having an impact on his business or brand. Hrdwre_Design started with on April 4, 2018 with 248 followers. Since then, his Instagram has started to grow his brand into a powerful tool for his business. His Instagram is around 9,000 as of Nov 1 2018. Deacon Bradley is a FB ads expert, VP of Operations at Tier 11, and a work from home Dad. Deacon is creating a B2B personal brand around his experience and journey constantly improving on his ability to manage teams working across the world managing Facebook Ads for clients while balancing his life working from home as a husband and father of two. Deacon and Tier 11 have had a huge 2018. Deacon has given talks to Facebook Corporate offices in Austin and New York while Tier 11 made Inc’s 5,000 Fastest Growing Companies in 2018 at #612. Way to go Deacon! Deacon started his IG brand fresh with us on April 12 2018 with 59 followers. His instagram has exploded into a thriving and growing community on IG and his influence and brand continue to spread. Deacon’s IG brand is set to pass 6k followers this week!! He identified that his Instagram would flourish with active organic traffic targeted to his business. He is a great photographer in beautiful Hawaii offering fun activity, food, and social tours of the picturesque paradise. Beautiful photos of happy faces in a tropical paradise worked well on Instagram. It works extremely well when we added active organic traffic into the mix. Great for entrepreneur's and personal brands just getting started growing organically on Instagram. Perfect for businesses of all shapes and sizes. This is our "Done-for-You" growth plan. Get the most out of organic growth on Instagram!